Anna Foster is now going to take us through a demonstration lesson on the power of found poetry. 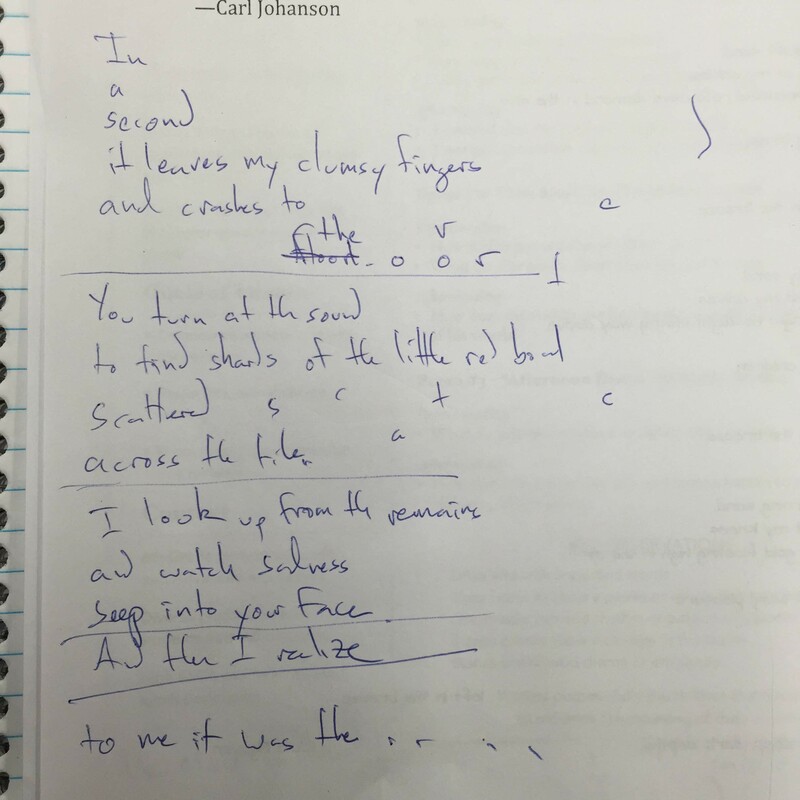 Quickwrite: How do you feel about teaching poetry to students? I’ve written about this before, but poetry isn’t my favorite. I’m a maximalist. I want long sentences, massive paragraphs, and all-encompassing narrative arcs. I like to dive into a world that has its own sense of gravity and immutable rules. While poetry might have that, it doesn’t for me. It’s just too short. But I love teaching it. 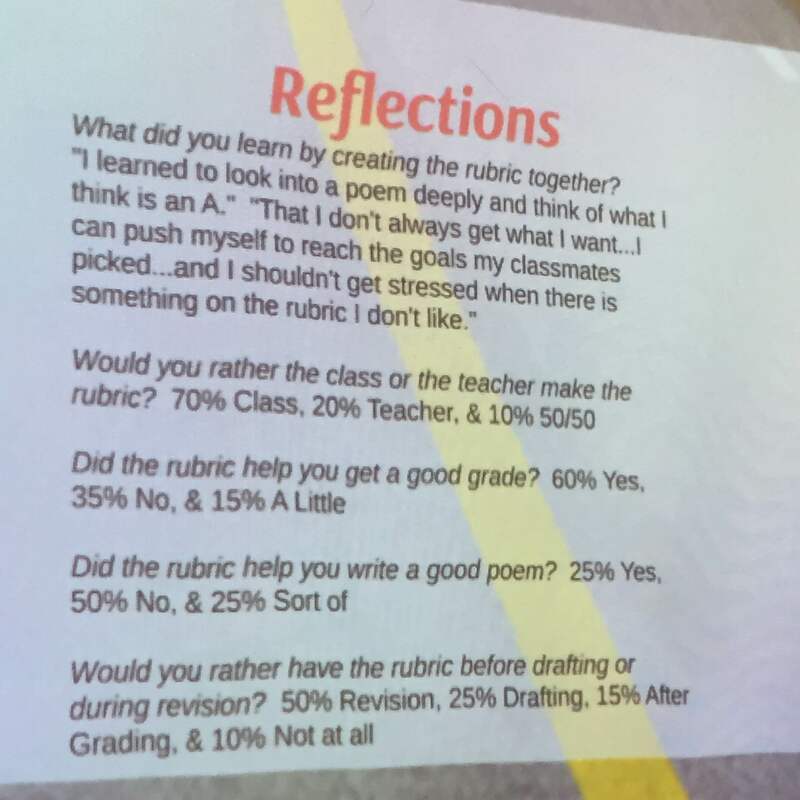 I spent the final weeks of the school year working with students on a variety of poems. Reading them, listening to them, annotating them, writing them. Poetry allows a slightly easier entry into literacy than writing a short story or a memoir. We share out. 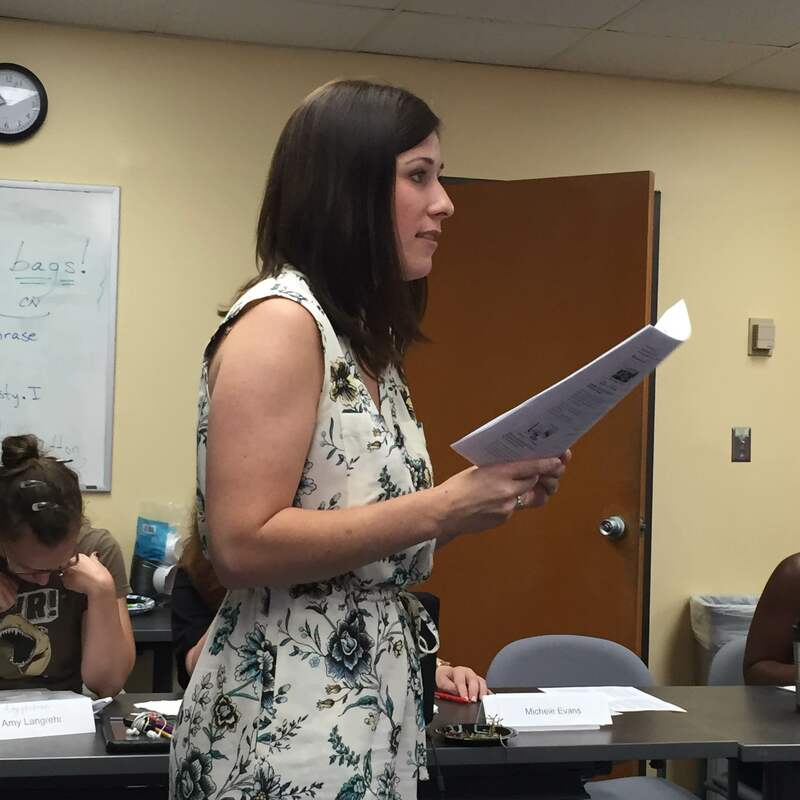 An ESOL teacher talks about how using poetry with beginning language learners can be difficult. But once the students get that basic language down, she continues, it becomes a function of liberation. 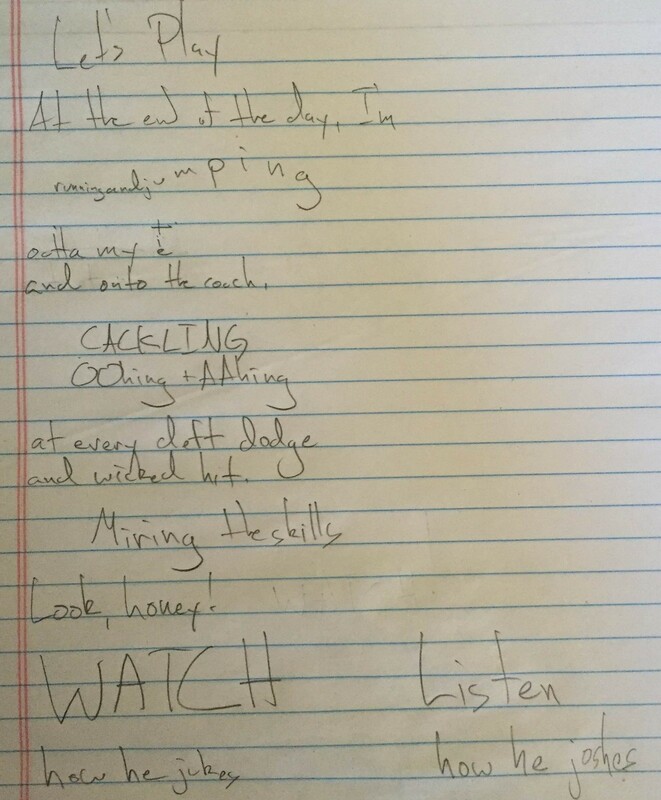 Someone else mentions how often we turn to what Paul Thomas calls the literary technique hunt. We use it for analysis more than writing, someone says. While there is positivity in the room, there’s also trepidation. Anna says that teachers can (and should be!) infusing every unit with poetry (vs. having a specific poetry unit). Poetry lends itself to essentially every literacy related skill. Especially, she says, found poetry. 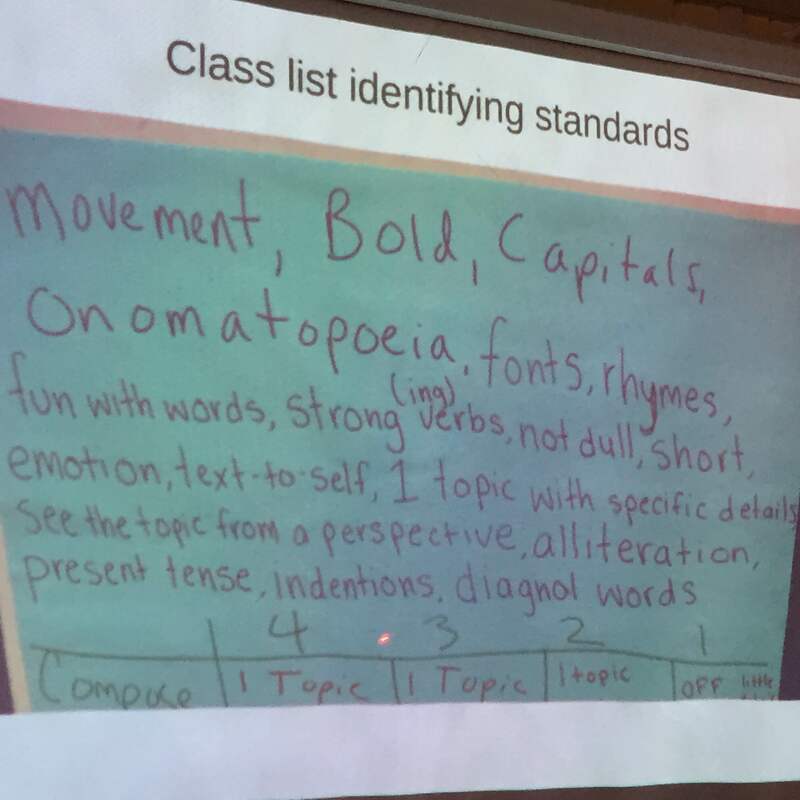 The fact that students don’t have to start from scratch is a big advantage to found poetry. Modern forms of found poetry include blackout poetry, centos, and cut and paste poems. Examples are below. Found poems allow students to become readers, writers, and artists. Anna runs us through a minilesson. As we listen to Clint Smith’s well-known TED Talk we’re going to keep track of any lines, words, or phrases that we enjoy. If you haven’t heard it, listen to it now. It’s that good. The minilesson corresponds with some awesome essential questions such as: How can language be powerful? How can silence be powerful? We watch the TED Talk and write. We talk a little bit about why we chose the lines we chose. Rearrange, position language differently, shape it, make it your own. You can have students enter the words into Word Mover, a free website (and app) that allows you to easily manipulate words on a screen. Anna shows us her own creative process and encourages us to talk with students about what we’re doing and why we’re doing it. This is a great place to talk about rhetorical purpose in writing. Here’s what mine looks like after a few minutes of tinkering. Every phrase comes from Clint’s TED Talk. She mentions how found poetry can be a cool way to think about research (gathering qualitative research and then remixing it into found poems) as well as social justice (since the content of found poems pulls from the texts found in the ‘real world). We end by viewing some student samples of found poems from Anna’s classes. Great lesson and presentation! 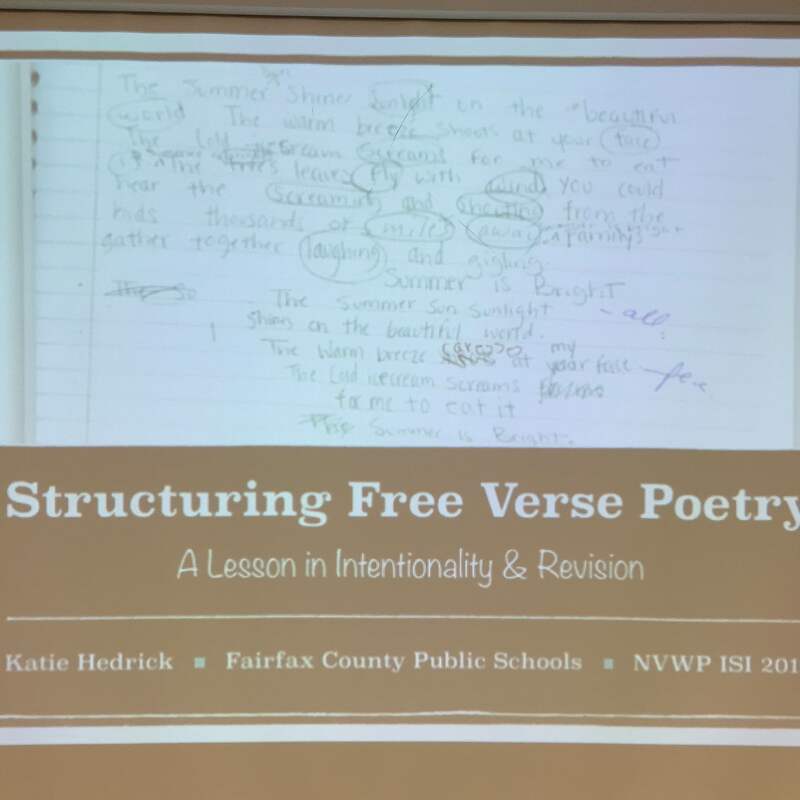 Katie designed this lesson because her students struggled learning how to effectively write Free Verse poetry. Most English teachers know how quickly children (and adults!) glom onto formulaic poetry such as haiku, sestinas, etc. There’s nothing wrong with formulaic genres; indeed, working under tight constraints is an excellent way to foster creativity. She begins talking about the idealist and the realist. The idealist is the part of her that wants to teach only lessons that she finds personally rewarding. At its best, this type of teaching helps educators tap into their own passions and bring that joy into class. At its worst, this sort of teacher-centric approach can lead to “hobby teaching,” a term describing when teachers only cover what they want to cover. Contrasting the Idealist is the Realist. The Realist is concerned with doing things simply because admin and standards and bureaucratic structures mandate them. In that sense, Free Verse poetry pops up in many high-stakes tests and benchmark assessments. This is an interesting bifurcation. 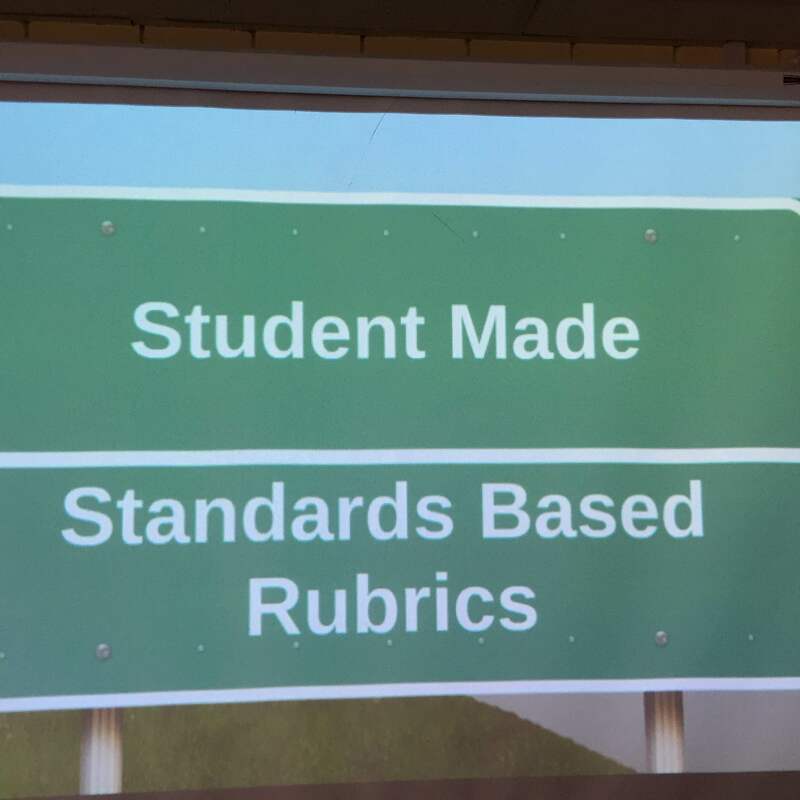 I often get the sense that many teachers carry an “I only do this because admin/test/state standards dictate it.” That if only we were free of these diversions we might be able to dive deeper into a practice that sustains us more as educators. My partner, Amber, discusses how mentioning the realist might also help with teacher buy-in by acknowledging the “but I have to do this because my _____ requires me to ____” mindset endemic in the teaching population. 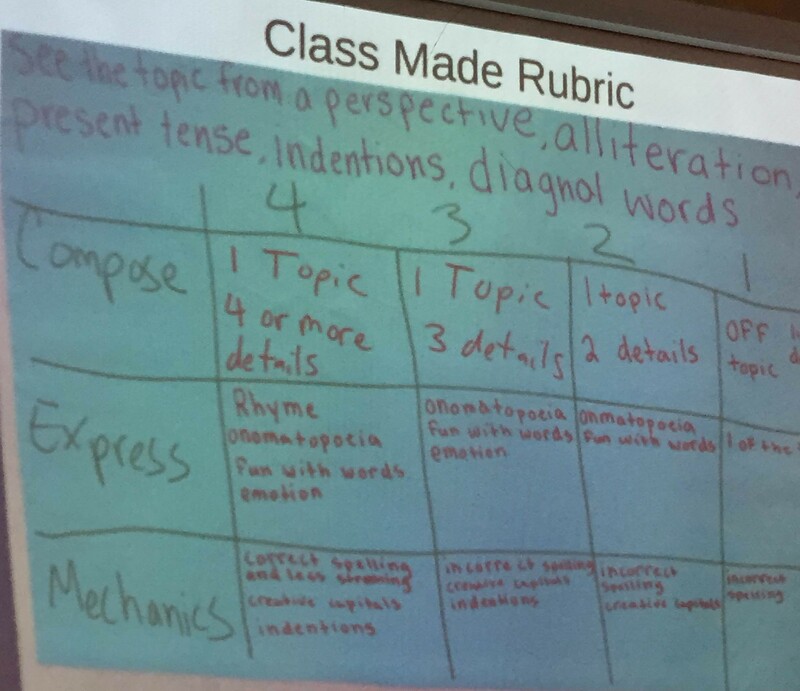 Katie’s problem was that her students’ poetry resembled paragraphs more than a poem. That’s where this lesson, the intentional use of line and stanza breaks, comes into play. At this point in the unit, Katie has already immersed her students in free verse poems. We begin by counting the number of lines in the poem, ‘Lost’ by Liam Anderson, and writing it at the bottom of the page. Then, we look at the number of stanzas. We notice (in the Kylene Beers way) things. How long the lines are, how long the stanzas are, the placement and mere existence of phrases, fragments, and complete sentences. How many lines are in this poem? Circle the words at the end of each line. Katie then reads us the poem (twice) using expression and volume dynamics. After her reading, she instructs us to answer the following sentence starters. We then share with our shoulder partners and then the whole class. Katie is a master teaching in the making. She brings us through a productive line of questions requiring us to notice, out loud, what words end lines, and what that means for the oral reading of the poem. We next read ‘The Meet’ by David MacDonald. It only has one stanza and 19 lines. We discuss how the form of the poem (no breaks, short lines) mirrors the form (a poem about bursts of speed during a swim meet). We discuss intentionality, how the author does things on purpose for specific reasons. 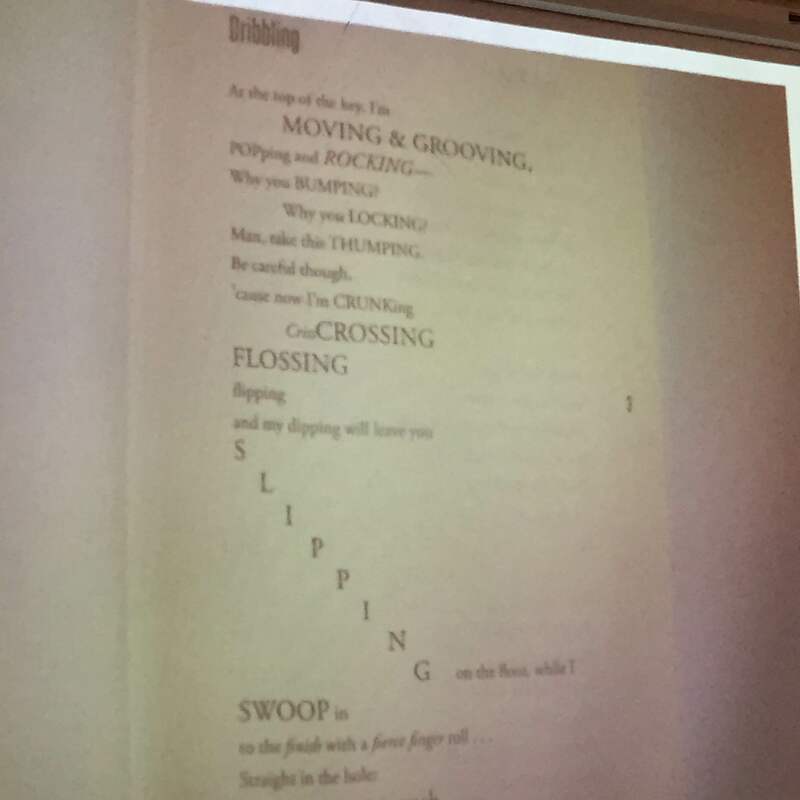 Katie then shows us a poem she’s written (free verse, of course, to match what the students are doing) that incorporates the same aspects of line and stanza breaks we’ve been discussing. What a pro! 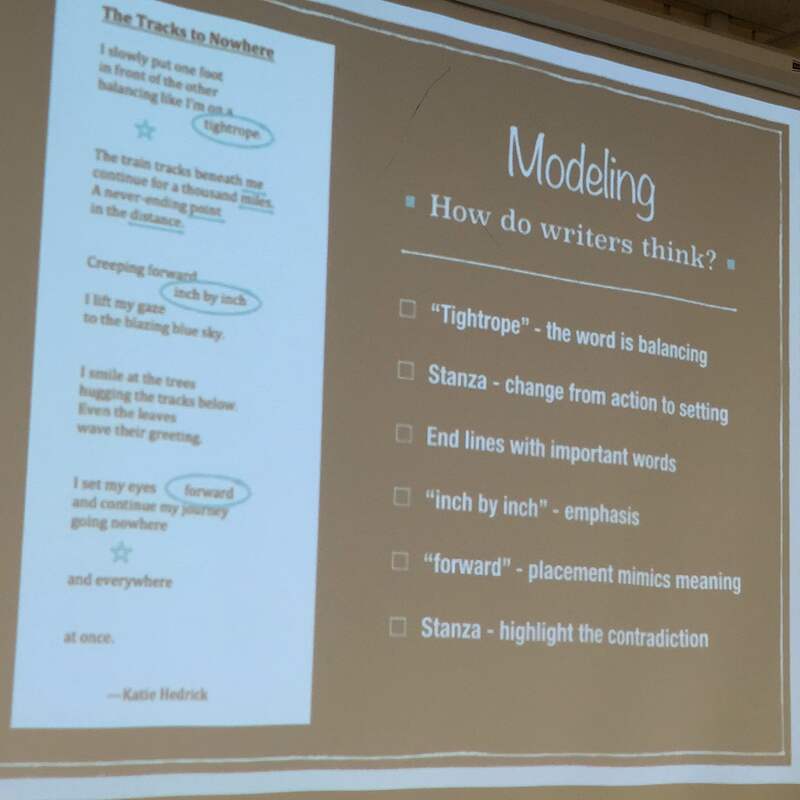 Her annotated example models how writers think. She makes her thinking public, explaining six specific choices she’s made. The message here is that we’re all writers. We’re all part of a larger community committed to writing, to the process of cracking meaning out of the aether. This “author talk” is essential. So, we move into the good work. Katie has us break the same paragraph into lines and stanzas. We discuss the similarities and differences in our individual break-ups. We all have various moments of “writer jealousy,” wringing our hands in envy at each fantastic turn of phrase and clever line break. A killer lesson. 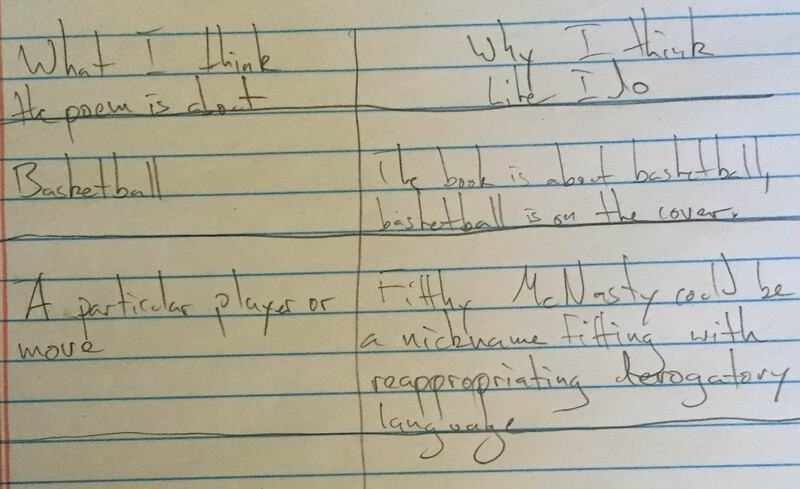 Changing students into writers. Introducing them to the validity and power of their own experiences. Giving voice to the world of children that, no matter how hard adults try, is a place of endless meaning and importance.